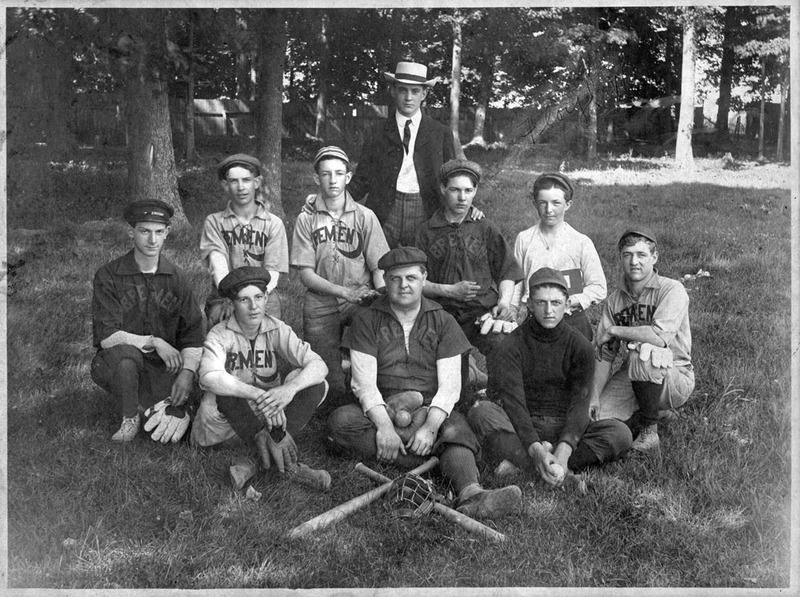 At the turn of the 20th century—back when the game was spelled “base-ball” and the word “fans” was printed in quotation marks to show it was just slang—Bremen fielded multiple fine baseball teams that played all over Michiana. Their names, and their opponents’, mostly reflected the color of their socks: blue, white, black, gray, red… But the best of them was the Bremen Greens, led by Art Carbiener. Carbiener’s father was the prominent businessman Jacob Carbiener, who was a part of the Bremen Cement Block & Tile Company and held various public offices. Even “buggy league” baseball was a paying institution in those days: fans paid their nickel at the gate of the fair grounds; players got $2 a game. Farm boys were known to use that money just to pay someone else to do their chores that day. But even the pros barely earned a living. Art and his brother Earl did odd jobs when they weren’t playing baseball. 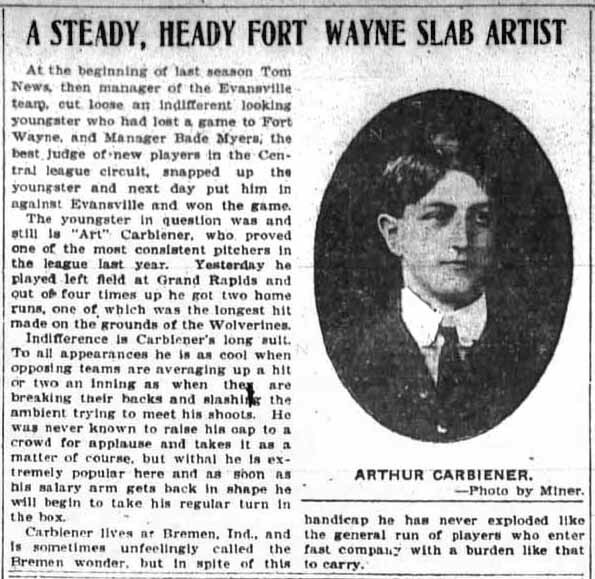 Art went on to make steadier money pitching for Evansville and Fort Wayne minor league teams, where they called him “the Bremen Wonder”, but he didn’t get sent up to the majors. Art soon returned to Bremen and continued to play for local teams like the Blues (AKA Blue Sox). Among his usual teammates were Frank Huff, Grover Walter, Bill “Little Willy” Helmlinger, Sr, and Floyd “Sandy” Weston. The newspaper reported on them regularly and colorfully. Click on any image to view a larger one. In 1910, Carbiener joined the newly formed Arcos as player-coach. 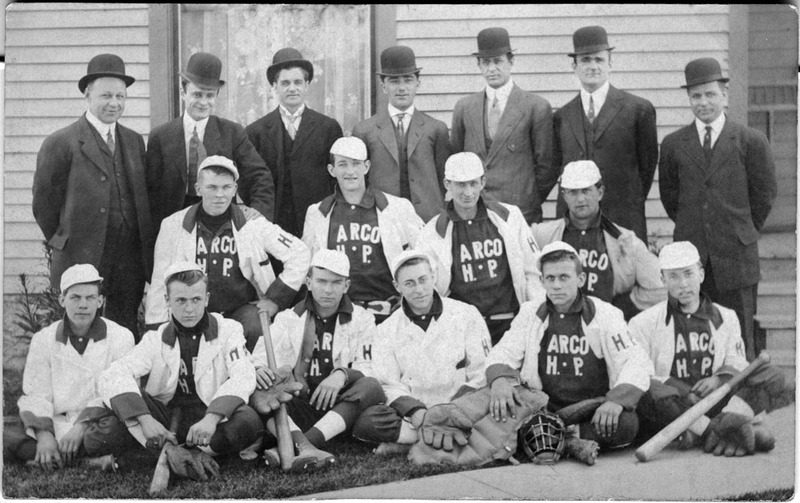 The Arcos were sponsored by the American Radiator Company (ARCO), and their blue and white uniforms bore the name ARCO with HP for Bremen’s Holland Plant. It included Roy Laudeman, Peck Holman, Porky Collier, Ike Kirkpatrick, Bud & George Lidecker, Earl Britton, Lloyd Yockey, and John Kastner. Sunnyside Park was founded specifically as a baseball park in 1910 on the former Samuel Mutti farm and replaced using the sandlot field at the fair grounds on S Center St. But it was only in 1921 that it got accoutrements like a roofed grandstand on a cement base and a fine scoreboard. Throughout the 1910s, teams came and went. The Bremen Boosters, the South Bend Spiros and Milkmaids, the Plymouth Athletics…. During World War 1, with most young men off to fight in Europe, paying baseball died out, carried on only by “kid teams” like the Little Giants. But Bill Helmlinger was a sports nut and a baseball fan in particular. He and friends brought them the Blues back in 1920, albeit with a more casual attitude toward uniforms. The Enquirer notes that one of the Plymouth players played in work clothes and another in an old army shirt. The team below, probably the Blue Sox, has a mix of uniforms that includes Otho Huff and Del Wertz in Arcos blouses. Baseball would decline again in the Depression and war years, and Art Carbiener, who lived to be 81, would come to be remembered as an old-timer who “loafed” in front Union State Bank (today’s Town Hall), reminiscing about his glory days. But the sport would rise again in the post-war years as softball and enjoy many happy years in Bremen at Sunnyside Park.